Here are some easy tips for growing wildflower Amsonia plants: Amsonia plants prefer moist, well-draining soil rich in organic matter, but they do well in most garden soil. Dry conditions will stunt growth, so in drier areas, plant Amsonia in semi-shade. Indoors, grow in a soil-based potting mix. Put Amsonia in bright light, and water freely. Fertilize every two weeks during active growth. In winter, just keep moist. Repot in spring. Description: These eye-catching perennial plants are low maintenance. Amsonia plants are drought-tolerant but will also tolerate wet soil. These plants grow 1-4 ft. tall and 1-4 ft. wide. 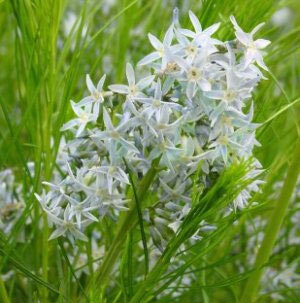 The pretty, light blue, star-shaped flowers peak in mid- to late spring. In the fall, the feathery green leaves turn a beautiful, butterscotch-yellow color. Origin of Amsonia (am-SO-nee-uh): Some types are native to North America; also found in Southern Europe and Japan. Propagation possible three ways: root division (in April/May); by seed collected in late summer and planted in Feb/March of following year; stem cuttings (in March/April). Maintenance: Low. After flowering, cut stems of Blue Star plants back by 6 in. to keep these perennials upright and in a mound shape. Remove seedpods to stop Blue Star plants from self-seeding. Health Risk/Bonus: Amsonia plants have a latex-based milky sap that may irritate sensitive skin. This sap will keep slugs and snails away.